Liver shunt is a very serious congenital defect that can affect our breed. If left untreated, it is often fatal. The Biewer Club of Canada has implemented guidelines to test puppies for this devastating defect. Breeding pairs that produce a puppy with liver shunt should NOT be bred to one another again. With proper, timely, diagnosis, most cases of liver shunt are treatable with diet and/or surgery. Puppies that have had a liver shunt, should ALWAYS be spayed or neutered. Let us explain the anatomy and physiology of a liver shunt. In the fetus, a normal shunt is present that causes the blood to bypass away from the liver to the placenta so that the mother can cleanse the fetal blood during development. This normal shunt is called “Ductus Venosus”. During the first few days of life, the shunt closes and the puppy's liver must begin to clean the blood itself. Sometimes the shunt does not close, producing “Patent Ductus Venosus” or a congenital portosystemic shunt. A portosystemic shunt allows blood to bypass the liver without being cleansed. Because the liver does not filter the blood properly, toxins begin to build and the puppy begins to exhibit side effects. As a result of this process, the liver also remains small in affected dogs. There are several blood tests and procedures that can be done to identify and treat liver shunt. In the future, we hope a simple blood test will be able to identify carriers, allowing breeders to eliminate this terrible defect from the Biewer and other dog breeds such as Yorkshire Terriers, Tibetan Spaniels, Cairn Terriers, Havanese, Shih Tzu, and Maltese. Our sister club, the BBCA is currently working with Dr. Sharon Center, DVM, DiplACVIM, Professor and Internal Medicine Specialist of the department of Clinical Sciences, College of Veterinary Medicine, Cornell University to help provide a base in genotyping Liver Shunt. Dr.Center developed the Bile Acid Test and believes that Liver Shunt is an ancient mutation that involves vasculogenesis or angiogenesis (embryologic formation of the blood vessels). Dr. Center believes the need to establish a demonstrated genotype linkage between the breeds is crucial to saving future generations from this issue. A patient may present with many clinical signs or only one. Some dogs don’t even show signs until they are older. For more information on signs, diagnosis, and treatment of liver shunt, please refer to the link below. OFA's mission is to provide radiographic evaluation, data management, and genetic counseling for canine hip dysplasia. 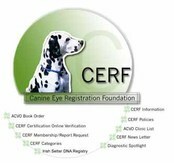 The Canine Health Information Center, also known as CHIC, is a centralized canine health database jointly sponsored by the AKC/Canine Health Foundation (AKC/CHF) and the Orthopedic Foundation for Animals (OFA). The CHIC, working with participating parent clubs, provides a resource for breeders and owners of purebred dogs to research and maintain information on the health issues prevalent in specific breeds.